Mashatu Game Reserve is located in the Northern Tuli Game Reserve of Botswana bordering South Africa and is internationally recognized as the “Land of the Giants”, home to the world’s largest mammal – the Elephant, the world’s tallest mammal – the Giraffe, the world’s largest antelope – the Eland, the world’s largest bird – the Ostrich, and the world’s heaviest flying bird – the Kori Bustard. Add the lion – the king of the beasts, and the iconic baobab…and you have Africa’s Big Seven. During our recent four days in Mashatu we discovered what must be another giant – this time an insect both huge in size and huge in numbers. 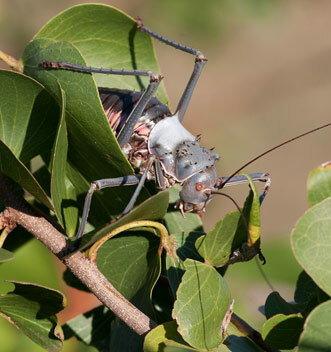 The Corn Cricket Acanthoplus discoidalis is a species of flightless katydid found in the arid and semi-arid areas of Southern Africa. Following heavy rains, which create ideal conditions, they hatch in enormous numbers feeding voraciously on plant life in every direction. Looking like something from a Hitchcock movie, these prehistoric insects have vicious spines on their armoured thorax and a pair of large biting jaws, and grow up to 8cm in length. 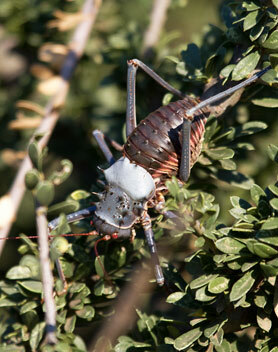 Wherever we looked there were Corn Crickets, hanging from the bushes, moving across the ground feeding as they go, or mating while dangling from branches. And as if all of this vegetation was not enough they are also cannibals and we watched some of them attacking and devouring fellow crickets without mercy and seemingly much enjoyment – creating a gruesome scene for a horror film! 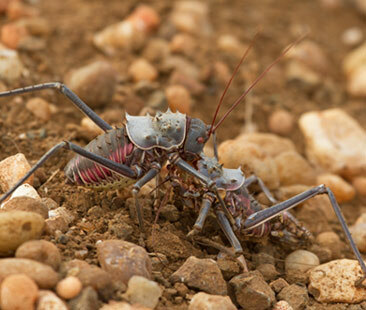 Their armoured exoskeleton provides excellent protection against predators and the only species that we saw eating them were several large Marabou Storks though other predators include the Bat-eared Fox, Black-backed Jackals and the Kori Bustard. A bizarre method of defense is the ability to squirting haemolymph (insect blood) up to 30 mm out of their bodies. Having squirted this distasteful, toxic ‘blood’ it must quickly clean itself before another member of the species is attracted and eats it. Another delightful defensive response is to regurgitate the stomach contents when attacked. Mating & Devouring Fellow Cricket! The courtship period is extensive and males stridulate to attract females. 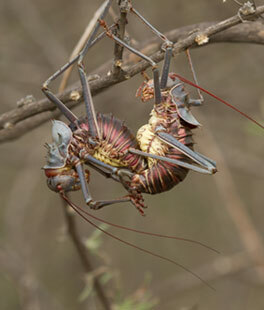 We watched many pairs mating while hanging from branches of the surrounding shrubs or trees. 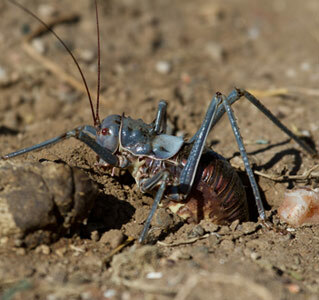 After mating the females dig a hole in the ground using the rear of the abdomen like a shovel and then lay parcels of eggs in the ground. 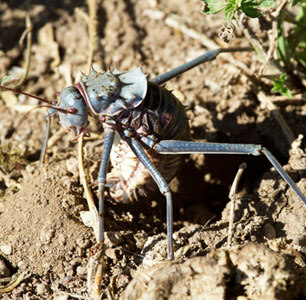 As one female was laying eggs we watched another cricket approach and start feeding on the eggs but this did not deter the female from continuing with her business. The eggs can remain in the soil for up to three years until the right conditions occur once again and the cycle starts over.